Maria Grazia Chiuri and Pier Paolo Piccioli are masterminds. Injecting dreaminess, drama and brilliance to the Valentino house, the duo have made their womenswear collection one of the most sought after collections of each season. I haven’t witnessed a Valentino menswear collection so when, by chance, I clicked on it on Vogue Runway, I didn’t expect the same excellence and inventiveness. Thankfully, it contained all the above. The womenswear Spring show was inspired by African tribalism. 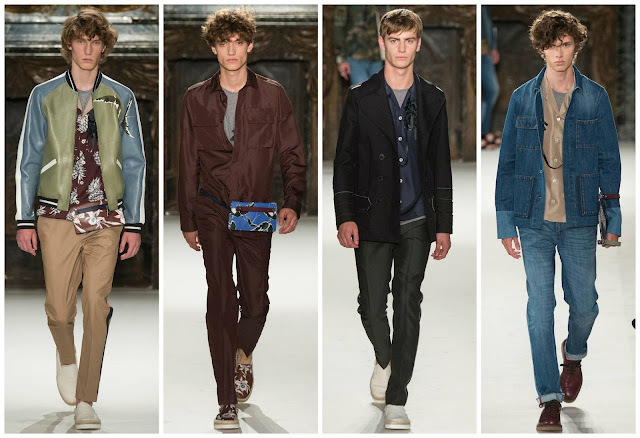 The menswear collection, presented in June, had similar tribal motifs, but to North America. It also referenced camouflage and denim. All the components were quite casual, but were given a luxurious spin. The denim seen in this collection were handmade in Rome. I am skeptical when it comes to double-denim. It works for some people, but it looks bad on others. One denim shirt and jeans combo was styled with a blue camouflage coat. The coat simplified the looks and made the double-denim more tolerable. A patchwork denim coat was worn over a denim shirt and trousers. The coat was intriguing, though ultimately an overkill. Am I the only one who thought one double-denim look, with a slouchy jacket, was infused with Kanye West’s style? A magical display of menswear, this collection's defining lineaments were the jackets. Served in a plethora of materials and styles, they provided great viewing pleasure. Without a doubt, they’ll come in at an extortionate price. However, when you can have something that retains a timeless desirability like Valentino, the price tag falls swiftly to the wayside.